A sign of things to come or an outlier? The Samsung Galaxy A7 (2018) has a triple camera on its back and a fingerprint reader on its side, quite an unusual design for Samsung. Perhaps we’re seeing the company test things ahead of the upcoming Galaxy S flagship. Because just like an S flagship, the new A7 model has a tall Super AMOLED screen, IP68 waterproofing and Samsung Pay. There are even things like a microSD slot and a 3.5mm jack, Samsung is one of the few remaining companies to offer such staples. But you probably want to hear more about the camera – should Huawei worry? 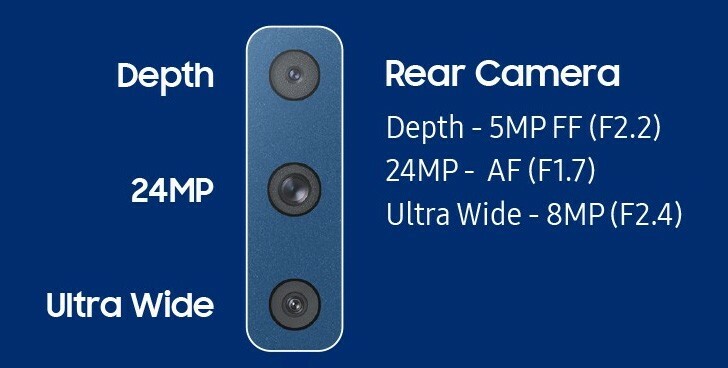 The triple camera setup on the Galaxy A7 (2018) features a 24MP main camera (f/1.7), an 8MP ultra-wide camera and a 5MP depth sensor. That last one would ideally have been a telephoto camera. There’s a single selfie camera with a 24MP sensor and a fixed focus f/2.0 lens. This is a premium mid-ranger and it has plenty of features, but not everything. Which is reflected in the price, €350, which would probably prove to be less than half the cost of the next Galaxy S.
The A-series typically have a less than impressive chipset and this one is no exception – an octa-core A53 processor won’t impress anyone. Not when several Honor phones pack Huawei’s top chipset and the Pocophone F1 gets you a Snapdragon 845 for €300. Then again, there’s only one mid-ranger with a triple camera and it’s the Samsung Galaxy A7 (2018). Samsung Galaxy A7 (2018): love it or hate it?